Order your Aurora 88 Black Satin Rose Gold Rollerball today from FahrneysPens.com. Fine Pens, Refills & Luxurious Gifts – great prices & fast shipping. An unforgettable Italian writing instrument from the 1950s, the legendary Aurora 88 maintains a cult status among fountain pen aficionados. Designed by Marcello Nizzoli (who also designed the iconic Olivetti typewriter), the 88’s understated style and retro appeal is achieved in the sleek new satin matte black resin with rose gold plated accents. 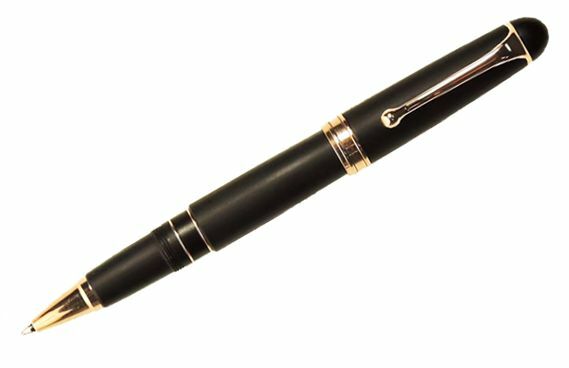 The large 88 fountain pen features a 14K rose gold nib with regular or ITALIC point and an ebonite feed. Its ingenious hidden reservoir keeps the ink flowing for an extra page when your supply is low. 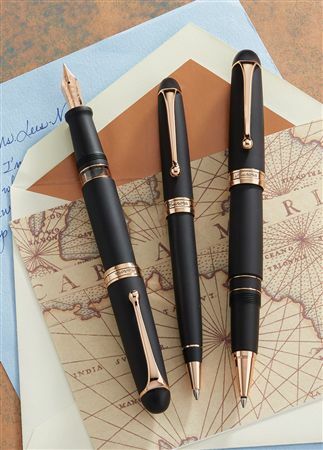 The Black Satin large capped rollerball and twist ball pen share the distinctive look and high performance that make the Italian-made Aurora 88s an all-time favorite!